Last weekend was race weekend. I signed up for the Knoxville half marathon back in November thinking I had plenty of time to train, and it was “only” a half, so no big deal! At least I wasn’t training for a full, right? 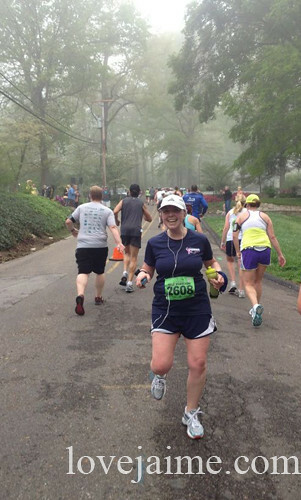 I underestimated just how important my training would be – and this was a tough race. Saturday morning, we started our short drive over to Knoxville. We were meeting up with Brooke and Bari. We were originally going to stay with Brooke, but about two weeks before the race, we made the decision to get a hotel room (smart decision, too. That might be for a different post, though.) We were delayed a couple of times because we forgot things like baby stuff and a cell phone. We made it to Knoxville close to 2 p.m., parked and hit up the expo. The expo was small, compared to most races I’ve run in the past. That said, I have run a lot of Rock ‘n Roll races (Nashville, Virginia Beach) so it isn’t really fair to compare this to those races. We were in and out of the expo pretty quickly and then got checked into our hotel room before trying to track everyone down. We met up at Barley’s and then made the rounds at two other pubs in the area. (I drank a lot of water.) We then had dinner (spaghetti, for the win!) at Brooke’s before heading back to the hotel around 8. That’s where things got tricky. The baby fell asleep in the car, didn’t go back to sleep until 10:30 and was up at midnight, 2 and 4 – for the day. I had no sleep, and didn’t have high hopes for the race at that point. The race was hilly, which I was prepared for because of running in Asheville. I just wish there had been a few more downhills. My plan of attack was to finish. 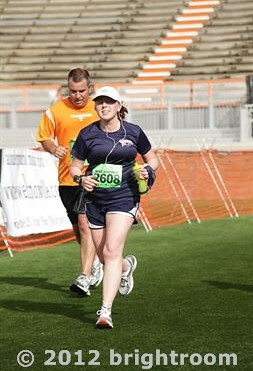 Mentally, I kind of wanted to finish in about 2:30, but I really just needed to finish the race. I had been training by walking at the top of each mile, and Bari was fine with that plan. We walked at just about the top of each mile (sometimes mid-mile, if we were on a downhill.) And, really, we just walked whenever we needed to. My body held up (for the most part) surprisingly well, considering my lack of training. Around mile 11, I started having some difficulty breathing. I just saw on Bari’s blog, though, that the air quality was a yellow yesterday, meaning some people may experience may experience respiratory symptoms. Totally explains that issue. It started on time. And we were across the start line about 3 minutes after the gun time. Lots of water stations – with Powerade and water. At least one (if not two?) stations had Gu on the half marathon course. Spectators. I love it when people come out of their houses to cheer runners on. Someone was announcing names of the finishers as they entered the stadium. That was pretty cool. The medal. And the shirt. I haven’t tried my shirt on, so fingers crossed that it will fit! There were a lot of uphills. I don’t know if this was a perk, but it was up. No mile markers for the first four miles. I saw a marker at mile 5. The finish support. We went in search of food, which was outside of the stadium. When we got there, the lines were insane, so we left. One not-so-pretty area that wasn’t through a neighborhood, but not necessarily a trail, either. Several bridges that had signs that said they were slippery when wet. They were soaked, and we had an interesting time making it across bridges (and a few steep declines) without sliding or falling. I’d say for as little as you were running before this race, you did fantastic, and it was definitely to both of our benefits that we had each other to run with. At every race I’ve done, I’ve seen people smoking before the race. It kills me. How? Why?! You girls did a great job. I’m not going to lie, I was a little jealous around mile ten and wishing I had someone to run by my side! That course does brutal with all the hills.